I left Robbie Williams' wildly anticipated concert last night with a slightly deflated feeling. It was good; it just wasn’t great. And I wasn't the only one who thought so. The man himself took to social media to complain about the crowd. I know they weren't overwhelmingly responsive – I was one of them. But Robbie dear, when you come to a non-English speaking country and sing dated covers and put an alien spin on your own hits, that's what you get. This wasn’t a concert for you, it was for us. I do believe the tour (and your show opener) is called "Let me entertain you". But between the first two songs and the encore, it fell apart a little. The 40,000 people in Tel Aviv's Yarkon Park on Saturday night had not paid hundreds of shekels to hear a big band version of "Supreme". They had paid to hear Robbie Williams belt it out like they themselves do in the car or in the privacy of their own shower. Williams is a good singer, but he does not have the vocal chops of some of his peers, and making the concert into an exercise in proving his talents could not have won him any fans last night. The less-than-impressive sound quality and the almost completely obscured screens didn't help either. Day before concert at Yarkon Park, British pop sensation takes stage for sound checks and performs four songs. But that's just the bad. There was an awful lot of good. Williams clearly loves being on stage, adores the spotlight, revels in the roar of an appreciative audience. This is where he comes into his own. When he sings his hits, he does have the crowd in the palm of his hand, bellowing the lyrics along with him, in the moment. And this is when his voice is the strongest. The familiar songs and music allow Williams to relax and that seeps through to the audience. When Robbie Williams sings his classics – "Let Me Entertain You" and "Rock DJ" at the start, "The Road To Mandalay" in the middle and "She's The One" and "Angels" at the end – it is thrilling and utterly enjoyable. He loses the crowd when he strays from this formula. This is a lesson that many seasoned performers learned long ago. There were so many covers of other people's songs that at certain points it felt more like Robbie Williams' tribute show than Robbie Williams' show. The songs were interspersed with banter befitting a man known for his charm and effervescence. Williams' positive comments about his first visit to Israel were certainly welcomed (Israel, he said, was "f**king amazing") and could be interpreted as a clear retort to the boycott crew that had targeted him in the run-up to the event. He was most endearing when performing songs for his children ("Twinkle Twinkle, Little Star" for his young daughter and "Motherf****er", which he wrote for his baby son) and also when he brought out his dad, who donned a tux to join his son on a stage for a duet. It was a little Phoenix Nights, but a lovely gesture nonetheless. Robbie Williams might not have the vocal range of Freddie Mercury, from whom he clearly draws inspiration, but he certainly has the same magical stage presence. When he gets it right, he gets it very right - and that handful of songs when he did was worth the price of admission alone. It's a shame there wasn't more of it. 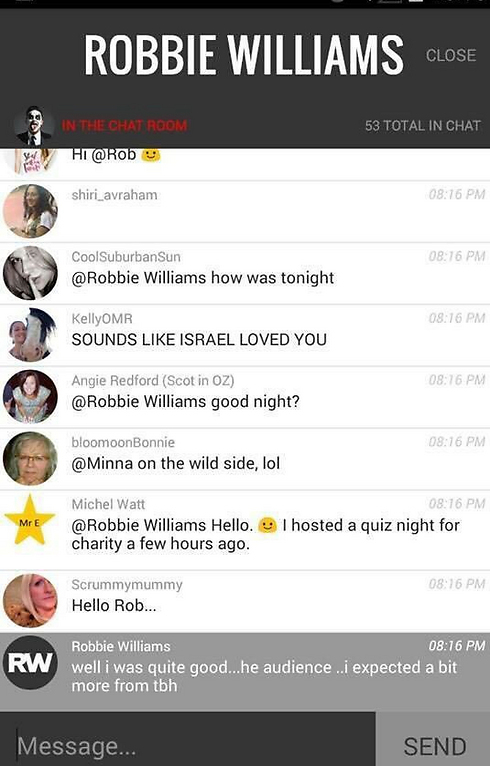 See all talkbacks "Robbie Williams in Tel Aviv: Solid, but not outstanding "